"All that district of country lying within the present limits of Sheboygan county, shall be a separate town by the name of Sheboygan, and elections shall be held in said town at the schoolhouse in Sheboygan, and at 'Giddings Mill.'" When first organized the county was separated from Brown county only for county purposes, but remained attached to the mother organization until 1846 for judicial purposes. On the first day of May of the year last above mentioned Sheboygan became a full-fledged county, with all the dignities and privileges thereto belonging. The election for the first officers of the newly created county was held, no doubt, on the day and date designated by the legislature and it is to be presumed, by the light of following events, that the men took up the duties and dignities of their offices and performed them well and diligently. But it is here that the historian is miserably handicapped in his endeavor to place before the public details so essential to a complete exposition of the proceedings of these early officials, their names and their characteristics. Very unfortunately and greatly to the loss of the county and lovers of local history, the records of all the offices of the county, with the exception of that of register of deeds, were destroyed by fire, in the month of January, 1860. The county clerk's office, with others at that time, was in the Otten block. Fire broke out in the building and. everything was lost, placing the county at a great disadvantage and to considerable expense. It is known that the first governing body was composed of three commissioners and that the offices then provided for by law were filled by certain of the able men who early cast their lot with the pioneers of the community. It is also to be presumed that these men were leaders, as were their successors, and gave the best that was in them to strengthen the new and growing organization and further its interests. In 1848 important changes took place pertaining to the methods of running the affairs of the county. The board of commissioners was abolished by law and the township system of government established. The first governing body, as has been related, was a board of three commissioners, who became, in a fair measure, rather autocratic in power and authority; so much so, in fact, that dissatisfaction arose here and there. A law had been passed in 1841, making it optional on the part of counties of the territory adopting the township system but, in 1848, the act was so amended as to make the system compulsory, so that, in the spring of 1849, supervisors were elected. From this time on until 1870, the county was governed by a board of supervisors, selected by districts, varying in its membership from three to seven. In 1870, the present system was adopted and since that time each town has been represented on the board of supervisors, certain of the villages and each ward in the cities. Elsewhere is given a complete list of the members of the body from 1870 to 1912. 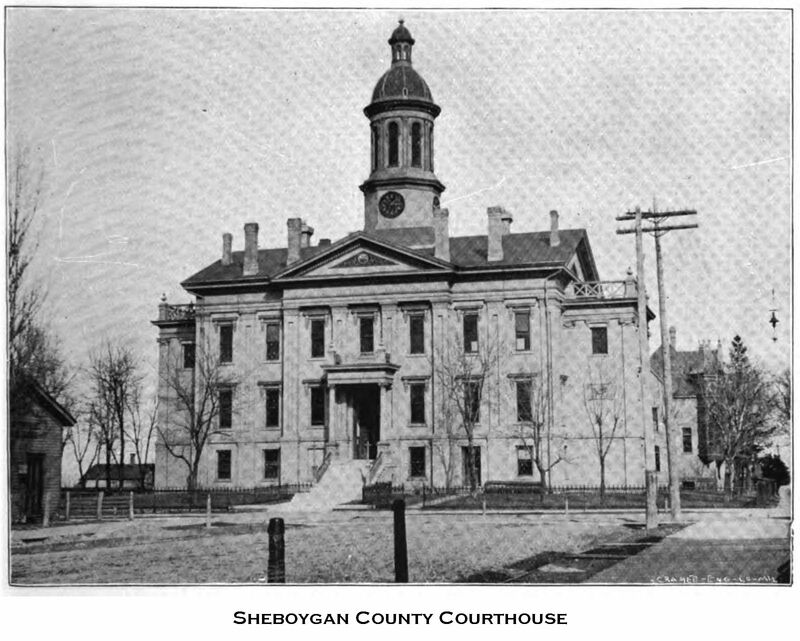 After Sheboygan county had been given a judicial status by the legislature, the final act of separation from Brown county designated June 1, 1846, as the time for holding the first term of circuit court at Sheboygan. The most convenient place for the purpose was the schoolhouse, and on the day mentioned a number of the settlers had gathered there, only to be disappointed by the nonappearance of the judge. On the following day, however. Judge Andrew G. Miller, member of the territorial supreme court, arrived, and opened the first session of the first term of court in Sheboygan county. The other members of the court were, John S. Rockwell, United States marshal; William P. Lynde, United States district attorney; D. U. Harrington, territorial district attorney; James Rankin, clerk; Silas Stedman, sheriff; Thomas C. Homer, bailiff. Grand and petit jurors were empanelled and if the former returned any indictments, no record of them exists. It is known, however, that the petit jury of that term failed to agree in a single instance, and any issue that was left for them to decide was either passed on to a future term or dropped for want of resuscitation. Numerous places were used for the sittings of the court; among them are remembered: The schoolhouse, the academy, Congregational church, an assembly room, Presbyterian church, first floor of what was known as the New York block, Turner hall and Zaegel block. When the courthouse was completed in 1868, as a matter of course, suitable rooms were set apart and used for a courtroom from that time on. In 1851 the first jail was built in the county. It was a small affair and stood on the ground now occupied by the courthouse. Long before it was torn down the old building had practically become useless and inadequate. In 1893 a present handsome and substantial jail was erected. The structure stands east of the courthouse, facing Center street and is only separated from the courthouse grounds by a driveway. Gentlemen: The undersigned, appointed by the presiding board a committee to make a thorough examination of the present condition of the courthouse and the accommodation and protection afforded the public records therein from loss, damage by fire or water in case of fire in the courthouse, and to make a full and thorough investigation of the present condition of the county jail from a sanitary and remedial point of view, have attended to their duty and beg leave to report as follows. We employed Mr. H. C. Koch, of Milwaukee, an architect of considerable experience, especially as regards the erection and arrangement of county and other public buildings, who has carefully considered the matter, and we submit herewith his conclusions and recommendations. There is no question but that the valuable records deposited in the several county offices are under present arrangements more or less in danger of being destroyed by fire at any time and should such a calamity ever befall us, it would result in endless expenditure and great inconvenience to the citizens of the county, for which the county board would justly be held responsible, as it is expected of this body that it should provide for the safe keeping of the records. That our present jail is in a very bad and unhealthy condition is a fact generally conceded, and the matter certainly requires the immediate attention of your honorable body. We do not feel authorized to make any special recommendations but submitting herewith the report of the architect, will leave the matter in your hands, having no doubt that it will receive the fair consideration it deserves. 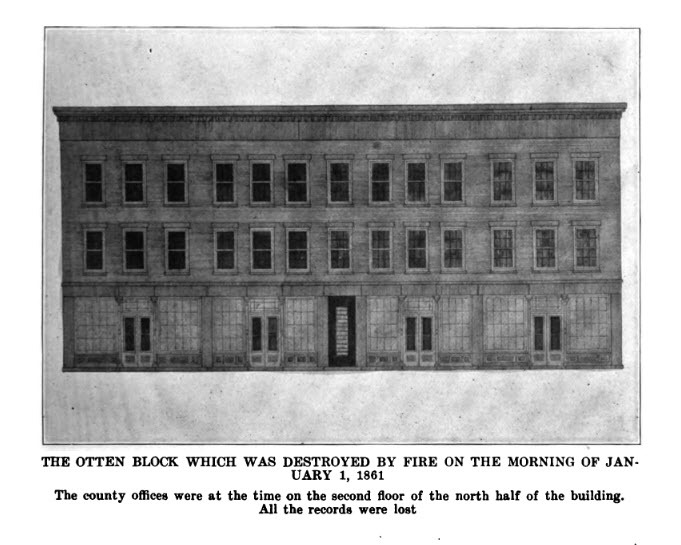 In the report of the architect mention is made of the condition of the jail and courthouse and a remedy was suggested to adopt one of three different plans, first to build a new and strictly fire-proof county office building, with vaults and other conveniences, and change the first story of the courthouse to a modem jail, the improvement in accordance with this proposal to cost as follows: County office building, $42,000; remodeling jail, $16,000. The second proposal was to build a new jail and sheriff's residence and new fire-proof vaults to the county offices in the courthouse. This improvement was estimated to cost: New jail, $25,000; new fire-proof vaults and steam heating plant for the courthouse, $23,500. A third proposal was to build an entirely new fire-proof courthouse, with steam heat, steel shelving and new furniture at a cost of $75,000; a new jail with steel cells, and sheriff's residence, at a cost of $25,000. In accordance with resolutions bids were advertised for proposals of a suitable site for a new courthouse and jail building, also of plans and specifications for a courthouse building and jail and sheriff's residence. Several offers of lots were made, ranging in price from $3,000 to $20,500. The only members of the board at this time who were in favor of a new courthouse building were Brand, Festerling, Freimuth, Guessenhainer, Lutze, Oetking, Renzelmann, Reyer, Strains and Zillier. The others were in favor of remodeling the old building, and of course the majority prevailed. On the 2nd day of December, 1892, an ordinance was passed which empowered the chairman of the county board and county clerk to issue bonds to the extent of $46,000 for the building of a new jail and remodeling of the courthouse - $25,000 for the jail, and $21,000 for the courthouse, the main feature of the improvement of the courthouse being four vaults and a steam heating plant. The ordinance was adopted by a unanimous vote of the board. The work on the courthouse cost $25,818.66, and the sheriff's residence and jail cost $21,635.68. In the early fall of 1909, to be exact, from the 9th day of August to the 14th, the period was designated as "Home Coming Week," upon which occasion Sheboygan city was given over to extending the glad hand of welcome to the sons and daughters of Sheboygan, who had found new homes in various parts of the land. Five days of jubilation, "talking over old times," and festivities were the results of a careful and elaborate plan. A beautifully illustrated "Official Souvenir" was printed under the auspices of the Business Men's Association and that part of the "Souvenir" devoted to the foreign (no longer) element, which so largely makes up the citizenship of the county, portrays so lucidly and comprehensively the early settlements in Sheboygan county of the Germans, Hollanders and others of near-kindred races, that a desire to quote the article, verbatim et literatim, is appeased by its reproduction below. In 1846 Sheboygan county had 1,637 inhabitants. In 1847 the number had grown to 5,580. The cause of this remarkable increase was the heavy immigration of Dutch and Germans during those years. The Hollanders were the first to turn their attention to this county. Under the leadership of G. H. Te Kolste a large settlement was made in the present town of Holland as early as 1846. The following year two hundred fellow countrymen who were bound for this port lost their lives within sight of their horror stricken friends on shore, in the burning of the propeller Phoenix. The Germans, with their inherent love of freedom, political and religious liberty and equality, had for a long time looked upon America as the haven of refuge from the troubles of their native land. But, although they desired to gain political liberty, they also wanted to preserve their nationalism. In 1832 a society was formed for the foundation of a German America. But this met with such strong opposition on the part of native Americans that the plan was given up. Niles Register for that year says: 'We shall give all such as these a hearty welcome, but the idea of settling in a large compact body cannot be approved.' In 1857 another society was organized in New York, which had for its object the maintenance of a strong German character, customs and education. They asked the government for a grant of land but this was refused for obvious reasons. So another plan was arranged. This was to direct emigrants to one state in the Union. There was some disagreement as to what state this should be, the choice being between Texas, Oregon and a great lake state. Wisconsin finally became the choice for the following reasons: There was free land, the constitution of the state was liberal, approximating the ideals of the leaders of their liberal party, the soil and climate were similar to those of their native land and the population as yet was scarce. Gradually a different spirit began to pervade the Germans regarding the segregation and isolation of German colonies in America. This was ably expressed by Carl Schurz some time later. He said: 'Let us never forget that we as Germans are not called upon here to form a separate nationality, but rather to contribute to the American nationality the strongest there is in us and in place of our weakness to substitute the strength wherein our fellow Americans excel us and to blend it with our wisdom.' The advantages of Wisconsin were urged by numerous books and pamphlets distributed throughout Germany. In 1849, for instance, a pamphlet was disseminated through the Rhine region by Gustav Richter, a citizen of Manitowoc, recommending Sheboygan and Manitowoc counties in particular. The settlement of German emigrants in Wisconsin began as early as 1839. From that time on to 1845 those who left the fatherland did so primarily to escape persecution for their opposition to the union of the Lutheran and Reformed churches, and to establish communities where their religion would be tolerated. The North Germans began the movement. In 1839 about a thousand of them, coming chiefly from Pomerania, departed for America and settled almost wholly in Milwaukee and Ozaukee counties. Cedarburg and Freistadt were founded by them. Between 1850 and i860 a large number of the settlers of these villages sold out and moved to the town of Sherman in Sheboygan county. In 1843 another emigration was made from Brandenburg and Pomerania. This was the last great emigration from those parts for some time, for by 1845 the religious strife had abated to some extent. Germans from other provinces of North Germany, however, continued arriving in great streams. In 1847 a group of several families from Hameln settled in Herman town and about a hundred families from Lippe Detmold, under the leadership of Frederick Reineking, took up lands in various parts of this and Manitowoc counties. The western part of Herman, the eastern part of Rhine, the neighborhood of Johnsonville and the village of Sheboygan became their homes. Others from this same region continued to come for the next five years. The first settlers were poor and were compelled to work in the sawmills. They bought government lands and mortgaged them. These mortgages, however, were soon paid off, due to their industry and thrift. The Lippers were members of the Reformed church and established at Franklin a mission house upon the German plan. /At this time, too, a body of Hanoverians arrived and settled in the towns of Sheboygan and Sheboygan Falls. Meanwhile emigrants from Rhenish Prussia, chiefly from the districts of Cologne and Treves, were settling in small groups along the lake shore. In Sheboygan county they were among the earlier settlers, coming in1846. The town of Rhine was settled by a large colony of Rhinelanders from whence it took its name. In 1847 economic conditions in the Wupper Valley were very bad and three hundred inhabitants of Elberfeld and Barmen, chiefly handcraftsmen and tradesmen of some means, went to America. A large niunber of them settled in Sheboygan. In 1848 a body of Luxemburgers settled in the extreme southern part of this county near Dacada, and by the following year nearly eighty families were living there. Five years later, owing to the failure of the harvests, a large number of their fellow countrymen emigrated and settled along the lake shore between Milwaukee and Sheboygan. They were young men with little means, nearly all of them belonging to the peasant class. Their farms were usually small because of the prevalence of the old custom of dividing the land equally among their sons. A few Bavarians, Swabians and Rhinelanders followed in the steps of their German brethren and settled in Wisconsin, a few joining the German settlements in this county, the majority, however, going to the southern and south central counties. The Saxons settled in Wisconsin as early as 1839, when seven families purchased a half section of Mequon. After they were prospering, they induced large numbers of their fellow countrymen to join them. In this way the present town of Mosel was settled. After 1854 the immigration of Germans to Wisconsin was checked to some extent. Some came almost each year, but another high water mark was not reached until about 1880. 'The attraction in Sheboygan to German settlers,' says Dr. Levi, 'has probably been the rapid growth of the manufacturing city of Sheboygan,' It is estimated that there are about 15,000 North Germans in the county, settled chiefly in the towns of Mosel, Sheboygan, Plymouth, Greenbush and Mitchell. As the Dutch and Germans had looked upon Wisconsin as the land of promise, so did the Belgians. On May 18, 1853, 325 of them from Grez Doician, county of Wavre, set forth for America. After they arrived in New York, where the state of Wisconsin was represented by a commission of immigration, they decided to make Wisconsin their home. All but two families went to Milwaukee, arriving in July. They then proceeded northward along the shore until they arrived at Sheboygan, where they decided to settle. But as none of them could speak anything but French and Walloon, they met with some annoyance at not being able to communicate with the people of Sheboygan. On this account they were induced to go to Green Bay by a native of those parts. Meanwhile a few Norwegians had settled in this county, principally in the city of Sheboygan, while a small group of Irish had taken up farms in the western part of this county. It was this hardy population of Germans, Dutch, Norwegians and Irish therefore that carried on the work that the American pioneer had begun. The present prosperity and wealth of this county shows how remarkably well they have done their work. Another period of immigration began with the close of the nineteenth century. The Austrian Slavs were the advance guard of this army of immigrants. 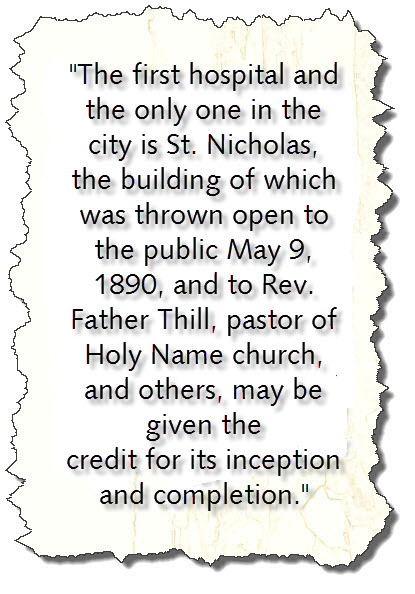 In 1888 Frank Starich, a native of Carniola, moved to this city. He was the pioneer of this group. In 1895 Anton Starich arrived here and these two men induced a large number of their countrymen to immigrate to this section. About 800 Camiolians are now living in this city. In 1897 and thereafter about 150 Steyers moved here under the leadership of Frank Schwartz. Four years later a large colony of Croatians settled in this city. They now number about 250 men. Most of the earlier Austrian settlers have become naturalized and a majority of the others have signified their intentions of becoming United States citizens. Since 1900 about 400 Greeks, chiefly from the provinces of Arcadia and Olympia, have settled in this city under the leadership of Dmetrius Shyriacopolos and William Adamopolos. A large number of Russians from the province of Lithuania also arrived during these years.